We've come to the second part of the "Stylish Tailgating" series - The Prep. I believe that preparation is the key to a successful tailgate experience. No one wants to fight traffic, get to their tailgate spot, only to realize they forgot something. A checklist of supplies is a great way to be prepared. I've included a basic checklist below. This list is a good place to start, but should always be tailored to your individual tailgates. “Emergency Tailgate Kit” – . You can make your own or this one from Sephora is great. I always have at the very least; Band-Aids, Neosporin, Advil, Benadryl, Tums, oil-absorbing powder, antibacterial gel, sunscreen, extra hair ties and lip gloss or chap stick. One week before the game, it’s a good idea to get your grocery shopping done and confirm what you will be eating or serving. 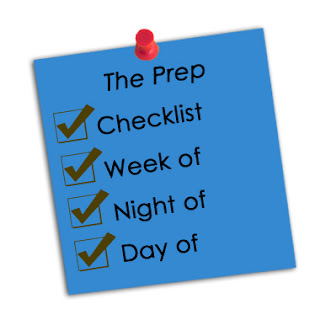 Run through your checklist and purchase any needed items. Stock up on popular items like chips, sodas and beer. I usually start cooking some of the sides a few days before too. The night before the game, I start packing up the car with the bigger items, like the tent, chairs, and grill. I check the weather forecast and determine if I need to bring any of the cold weather or rain gear. I also pick out my game day outfit and accessories. The day of the game is reserved for packing all of the perishable items and stocking the coolers. I like to designate one cooler for raw meat, one for sides, and one for drinks. Next week is the final part of our series and truthfully the best part – the party! This is where all of your planning and preparation pays off.